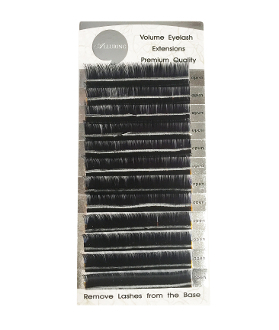 The 3 sizes mimic the different stages of growth natural eyelashes are in at any given time - no ones natural lashes are all the same size so applying extensions in the same manner will give a more more natural look. Designed for use with Volume lash work - when picking up fans, you will grab 2 or 3 sizes in each fan! Ideal for 3D,4D,5D application. The Alluring Blended Volume Lashes make Volume Lashing so much easier!! Not only are they easier to work with, they also have better retention and are better for the natural lash than the regular volume fans.